Located on the water in Adelaide, this eatery has amazing views both day and night from virtually every seat in the place. Owner and executive chef Ray Mauger takes pride in serving fresh, local food that varies with the seasons. As part of the drive to create a sustainable South Australia, Red Ochre has plenty of indigenous produce on the menu, including emu, kangaroo and crocodile, served with a mixture of native plants. The indigenous contributions to some offerings are obvious - kangaroo really couldn’t be anything else - but others, such as the rivermint sorbet or slow braised aniseed myrtle duck, may not have obvious wild ingredients (it’s the myrtle). The menu changes with the season and the availability of products, but every dish is freshly made and served in an Asian-fusion style. Sydney’s first bush tucker cafe was opened by Beryl van Oploo, an Aboriginal elder from the Gamillaroi people of central Australia. Aunty Beryl views the restaurant as more than just a place to eat; it serves to help secure the future of indigenous people, training them to use what the land gave them and share it with others. The cafe takes advantage of the versatility of bush foods, creating both sweet and savory dishes with the same ingredients. Riberries and quandongs are paired with pork and chicken, and also cooked into a jam that’s spread on pancakes or toast. Nearly every item on the menu has some ingredient that is from the bush, focusing mainly on plant ingredients. Drawing inspiration from the Butchulla tribe of Fraser Island, Seabelle chefs craft delights based on seasonal local produce and seafood. 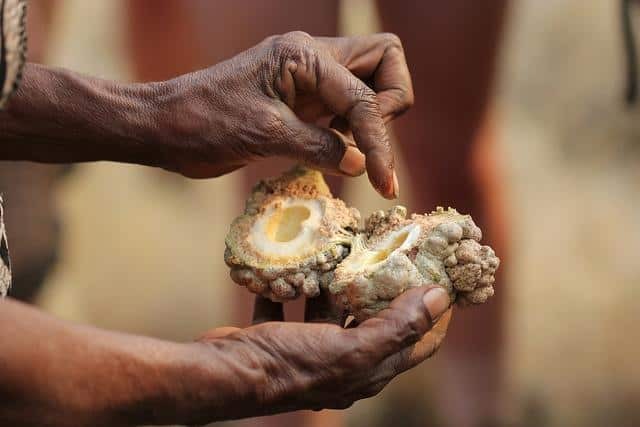 The Kingfisher Bay resort is so dedicated to promoting local foods that they hold ‘Bush Tucker Talk and Taste Tours’ three times a week, introducing guests to indigenous ingredients and explaining how best to use them in cooking. Seabelle serves kangaroo, emu and crocodile along with more traditional meats and has a wide selection of fish and seafood on the menu. Most items have an addition of bush tucker and some dishes are created entirely from indigenous ingredients. Bush-spiced kangaroo may be for the more adventurous, but who could pass-up muntharry berry and wild lemon vinaigrette for their salad, or wattleseed chocolate parfait? Aboriginal owned and managed, the cafe is one part of the Armidale & Region Aboriginal Culture Centre and Keeping Place. The fare is mainly bush tucker and the light meals are served with damper, the traditional seed cakes that serve the indigenous people as bread. They also have a number of native jams that vary with the season. Munch on some wattleseed shortbread and a cup of lemon myrtle tea as you decide between the kangaroo koftas and pumpkin-Bunya nut pasta bake for lunch. Chicken, beef and vegetarian options are available, most served with bush damper. For a lighter option, choose from the morning or afternoon tea menus or have an icy fruit granite to cool down. Owner and head chef Bryant Wells combines native herbs with locally sourced ingredients to create a menu that showcases Australian bush food in a way that even the least adventurous will be willing to try. Not only will you be titillating your taste buds, you also are supporting local farmers and fisherman when you dine here. The menu is filled with Australian meats including crocodile and emu – and even possum at times. Try the vanilla-cured Cairns Crocodile with a side of Lilly Pilly, Macademia and Bunya nut salad. Finish your meal with a mixed dessert plate to sample a variety of the sweet treats available. If you’d like to try several items, the restaurant offers two degustation menus with a large selection of meats, fruits and desserts. Mission Australia is a non-profit group that seeks to inspire people to regain independence after adversity. They run the restaurant as part of a training program for Aboriginal youth, teaching hospitality skills and providing on-the-job experience. Head chef Greg Hampton is not only an exceptional chef, he also teaches horticulture and cooking to the young trainees. In addition to a great training program, Charcoal Lane teaches their students that quality matters, even for a novice. The emu fillet is nothing short of spectacular and the wallaby sirloin is cooked to perfection every time. The pepperleaf aioli adds spice to fries and the Moreton Bay bug is delicious – and don’t worry: It’s a type of lobster. Even the desserts mix several bush plants and seeds to create a sensation of flavours that will make you a convert to myrtle and wattleseed.